(W) Mark Kidwell (A) Jeff Zornow, Nate Van Dyke (CA) Jay Fotos, Nat Jones. In 1968, the zombie-infested jungles of Vietnam and Laos explode with the coming of a grim hero for earth's new dark age! JUNGLE JIM is a one-man army, a reaper in a gas mask...JACK THE RIPPER WITH AN M-16...armored in burlap and bamboo against the living and the dead as he searches relentlessly for redemption in the heart of a rotting, war-torn apocalypse. 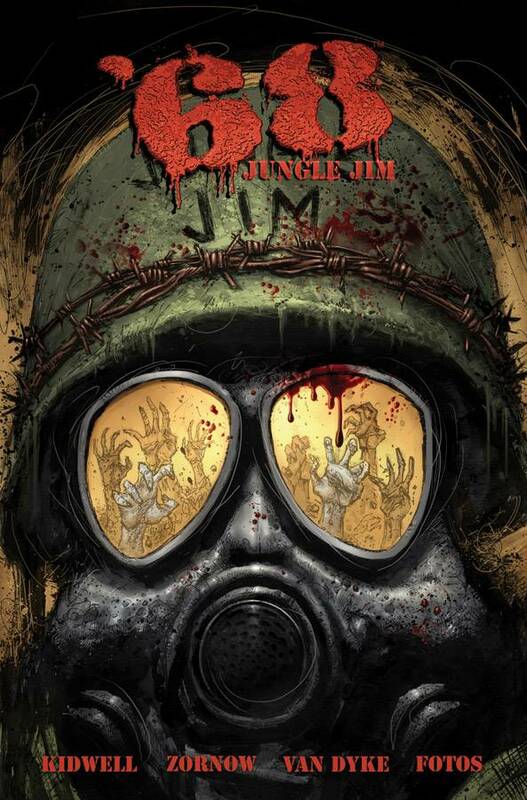 Whether he's rescuing American POWs from the clutches of the Viet Cong or staging a bullet-riddled standoff against hordes of the hungry undead to protect the occupants of a remote, French Catholic mission, Jim will put his life on the line and the metal to the meat! The world of the award-winning, sold-out '68 universe expands as this collected volume presents Jim's origin from the original one-shot comic along with the full-length mini-series in one massive, extras-packed graphic novel. Collects '68: JUNGLE (one-shot) and '68: JUNGLE JIM #1-4 .